I might have mentioned this last year, but my mother-in-law loves tea parties. She is not a huge tea drinker herself (she drinks peppermint tea occasionally and that's about it), but she loves the concept of dainty little sandwiches and beautiful place settings. She has quite the collection of tea pots and china, and she will take any excuse to pull them out:). She even pulls them out for tiny children. My 3 year old son can pour water from a tiny glass teapot into a tiny glass teacup like a boss- and he's been doing it for over a year! She trains them young;). Easter is no exception, and in fact, this is when she really goes all out. Instead of the traditional ham and potatoes dinner, my in-laws do an amped up tea party; basically all food must be finger foods or little side dishes that can be eaten with small utensils. It's a ton of fun! We always have more food than we can eat because everyone is bringing a favorite appetizer recipe to share, and they are usually filling and delicious (so we don't really stick to the dainty sandwich thing;) ). I particularly love this idea because it gives me a chance to try recipes I might not try otherwise (I'm not going to make a huge plate of appetizers when it's just me and the hubby to eat them!). I love any excuse to try a new recipe! 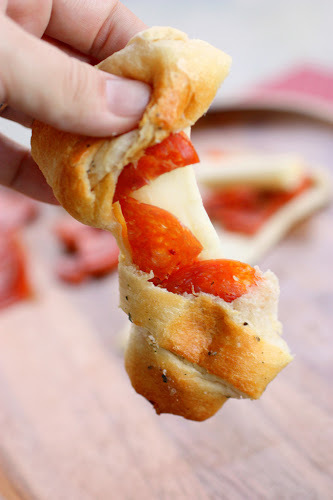 And this year I definitely found a keeper: Pepperoni Cheese Stick Roll Ups (like I said, we kind of forget about the dainty sandwich thing- or at least I do;) ). These were a huge hit. Everyone was raving about them, and there were no leftovers (sad, but usually a good sign;) ). My kids loved them too, which is always another star in my book. But honestly, what's not to love about incredibly cheesy rolls stuffed with pepperoni and topped with butter and the most perfect combination of seasonings? Yeah, they are pretty much amazing:). Another thing I loved about this recipe was how simple they were! They literally take less than 5 minutes to put together and then another 14 minutes to bake. Simplicity= another gold star. 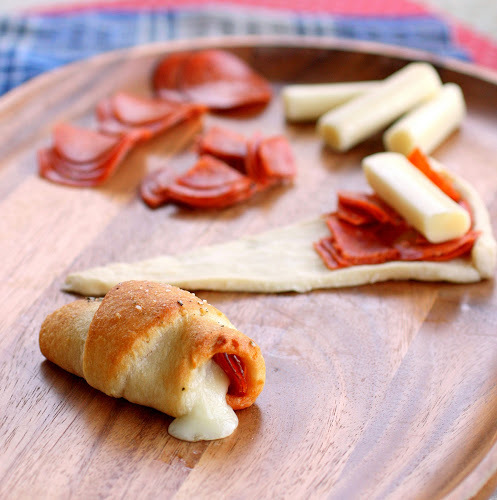 All you need to make these cheesy heaven-in-your-mouth rolls are one can of crescent rolls, 4 cheese sticks, and plenty of pepperoni. Spread out your crescent rolls, but don't roll them just yet. Place 5-6 pepperoni (or more if you'd like;) ) on each crescent roll, and then place half a cheese stick on top of that. Roll them up and pop them in the oven. When they come out, brush them with a delicious combination of butter, parmesan, Italian seasonings and garlic powder. The original recipe says to dip them in marinara sauce or ranch, but honestly- we all just ate them plain;). There is plenty of flavor in the roll itself without an additional dipping sauce- but dipping sauces never hurt;). These were a great little dish, and they actually made a great dinner too! I had some cheese and pepperoni leftover and they were the perfect dinner to make because I was feeling sick that day and these took me just 5 minutes on my feet. Pair with a salad and you've got an easy dinner on your hands! Does anyone else do tea parties/appetizer get-togethers? 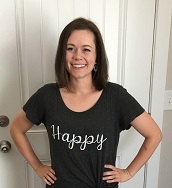 I'd love to hear about your experiences! Share below!